Pergolesi died at the age of 26, probably of tuberculosis. But, between the time he started to study music, c. 1720, at the Conservatorio dei Poveri at Naples and his death, a mere sixteen years had elapsed. Mozart (27 January 1756 – 5 December 1791) died at a young age, 35, as did Schubert (31 January 1797 – 19 November 1828), who died at the age of 31. In 1732, Pergolesi was appointed maestro de cappella to the prince of Stigliano, and, in 1734, he became deputy maestro de cappella, in Naples. Pergolesi was such a fine violinist and composer that, during his own life time, he was called the “divine,” by his followers. For musicologists, he is, first and foremost, the composer of the Serva padrona (“The Maid turned Mistress”), an opera buffa, or comic opera, composed in 1733. But if we exclude the circumstances that made his opera buffa and its composer famous, he is remembered mainly for his Stabat Mater, a sacred work he composed the year he died, in 1736. The Stabat Mater was commissioned by the Confraternità dei Cavalieri di San Luigi di Palazzo, a group of pious and generous gentlemen. However, by 1736, Pergolesi had also written a Mass in F and his long and very mature Magnificat in C major. In Naples, he composed his Mass in D and his celebrated Stabat Mater. Pergolesi also composed instrumental music: a violin sonata, a violin concerto, a concerto for flute, and other instrumental works. But doubt lingers concerning the authorship of some of the instrumental music attributed to him. Investigators are at work. So, we now come to his operas. In Naples, Pergolesi had written Lo frate’nnmmorato, an opera buffa (comic opera). But he had also composed an opera seria (serious) entitled Il Prigioner superbo (The Proud Prisoner), a work which contained a two-act comedia buffa, La Serva padrona (The Maid turned Mistress). It is this opera buffa that made him a celebrity, albeit posthumously. La Serva padrona, an intermezzo, was in no way subversive It had been composed to a libretto (the words) by Gennaro Antonio Federico who gleaned some of his material from a play by Jacopo Angello Nelli. In fact, not only was it not subversive, but it had already been performed in Paris, on October 4th, 1746, without attracting much attention. But in 1752, circumstances had changed. For one thing, the August 1st, 1752 performance of La Serva padrona (“The Servant turned Mistress”) took place at the most elegant venue in Paris: the Opera, or the Académie royale de musique. Moreover, it was performed before an élite audience. As a result, this one performance led to an unpredictable two-year quarrel (1752-1754) that opposed the most brilliant minds among the “lumières,” including d’Alembert, Diderot and Jean-Jacques Rousseau (28 June 1712 – 2 July 1778). But Rousseau is the person who threw the first stone, except that the “querelle” was a paper war. The “Querelle des Bouffons,” or “Quarrel of the comic actors,” was indeed a paper war. It took the form of an exchange of letters and pamphlets, totalling sixty-one documents, all written by the most erudite “philosophes” of the French Enlightenment, not to mention a bevy of salonniers and salonnières. It was the event of the century, prior to the French Revolution. Yet, it would not be altogether fair to give circumstances the leading role in the “querelle.” Pergolesi’s Serva padrona is an opera buffa, but it had been composed by Pergolesi, the “divine,” and talent supersedes genre. In other words, the performance of the Serva padrona was a catalyst in the “querelle,” but it is unlikely that a lesser opera buffa would have unleashed a fury. No greater compliment was ever paid Pergolesi. The Serva padrona was so delightful an opera buffa, that Geneva-born French encyclopédiste and musician Jean-Jacques Rousseau could use it to oppose French opera. There had long been tension between Italian music and French music, then dominated by Jean-Philippe Rameau (25 September 1683 – 12 September 1764), the author of a Treatise on Harmony, published in 1722. As you know from an earlier blog, this treatise remains authorative. But although the “querelle ” could be considered as yet another battle in the war between French “ramistes,” the name given supporters of Rameau, on the one hand, and lovers of Italian opera and commedia dell’arte, on the other hand, it may be best to suggest that it opposed reason and sentiment, or sense and sensibility. In short, because Pergolesi’s Serva padrona was exquisite in its genre, it was the perfect weapon in a war against “ramistes,” which means that if sentiment and the Italians won that particular battle, the “querelle” also constituted abundant praise of Pergolesi’s talent. Without this weapon of choice, the Serva padrona, there may never have been a “Querelle des Bouffons” for sheer lack of ammunition. YouTube allows one to listen to and to view the Serva padrona in its entirety, but Pergolesi’s Stabat Mater remains the centrepiece. I hope you enjoy listening to some music composed by a forever young Pergolesi who died in poverty in a Franciscan monastery, at Pozzuoli, near Naples, aged 26. [i] “Giovanni Battista Pergolesi”. Encyclopædia Britannica. Encyclopædia Britannica Online. Encyclopædia Britannica Inc., 2011. Web. 20 Dec. 2011. <http://www.britannica.com/EBchecked/topic/451597/Giovanni-Battista-Pergolesi>. “Giovanni Battista Pergolesi”. Encyclopædia Britannica. Encyclopædia Britannica Online. Encyclopædia Britannica Inc., 2013. Web. 06 déc. 2013. Jean-Jacques Rousseau (28 June 1712 – 2 July 1778) was a political philosopher, one of the encyclopédistes, an educator, a novelist, and a composer. He wrote the Encyclopédie‘s entry on “Music.” As a musician, he was also the main figure, with the Baron Melchior von Grimm, in a “Quarrel” (“Querelle des Bouffons” or “War of the Comic Artists”), perhaps the most famous mêlée in the history of music, not to say eighteenth-century philosophy: sentiment over reason! Not quite, but nearly so. I have posted an article on Pergolesi and discussed this event. The “Querelle des Bouffons” started after the second performance, in Paris, of a short intermezzo, La Serva padrona (The Servant Turned Mistress), composed by Pergolesi (4 January 1710 – 16 March 1736), performed at the Royal Academy of Music, the Paris Opera, on 1 August 1752. Pergolesi’s intermezzo charmed the audience and everyone wrote a letter or pamphlet, some 61 documents, on the subject. The many commentators were writing about the relative merits of French lyric tragedy, a serious genre, and Italian opera buffa, meant to entertain the audience during a pause (between acts). The letters made it clear. By and large, the audience wanted to be moved by music, moved to tears, in some cases. Jean-Jacques Rousseau had started the quarrel and part of his arsenal was an operetta, or intermède, entitled Le Devin du village (The Village’s Soothsayer), first performed at Fontainebleau, on 18 October 1752, two months after the performance of the Serva padrona. However, as noted above, what was at the stake was “reason” versus “sentiment.” Reason was not defeated, but sentiment gained considerable ground. Jean-Philippe Rameau was at the time the most prominent composer in France. His tragédie lyrique came under attack, but his 1722 Traité de l’harmonie, the theory of music, remains authoritative. The quarrel lasted two years. However, Le Devin du village, composed by Rousseau, was performed at court in 1753 and attracted audiences until 1830. It was last performed in 1830, the day Hector Berlioz premiered his Symphonie fantastique, a masterfully orchestrated symphony. There has been a revival of Rousseau’s Devin du village and, particularly, of the aria “J’ai perdu tout mon bonheur,” sung by Colette, when she thinks Colin is no longer in love with her. It seems to have entered the standard repertoire. Interestingly, Rousseau is the first composer to have written both the music and the libretto of Le Devin du village. This is a mostly literal translation. Creating poetry was not my purpose. I concentrated on making the French text clear and divided it using numbers. Rousseau was an exceptionally gifted and accomplished individual, but most musicologists do not consider Le Devin du village a masterpiece. However, as mentioned above, “J’ai perdu tout mon bonheur” is performed more and more frequently and, from a historical point of view, Le Devin du village is an important intermède. Colette soupirant et s’essuyant les yeux de son tablier. J’y songe sans cesse ! RELATED ARTICLE: my personal favourite post, because of Pergolesi, dead at 26. 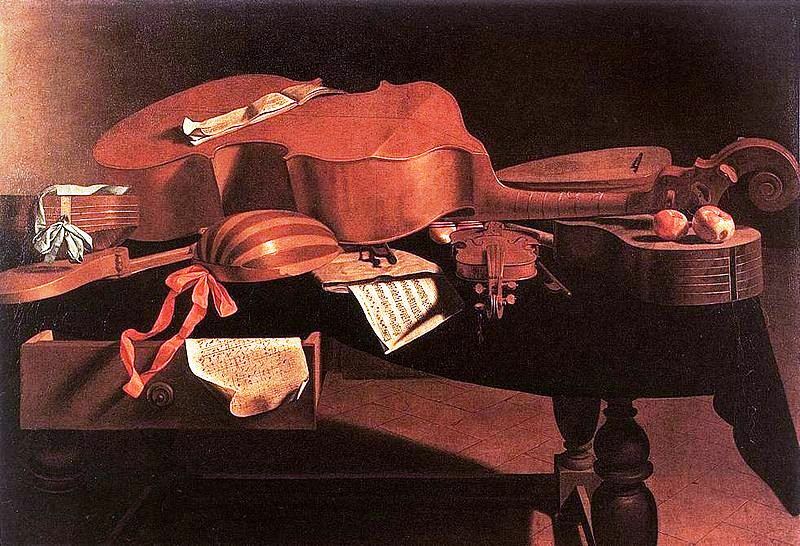 Baroque period instruments: a hurdy gurdy, a viola da gamba, a lute, a baroque violin, and baroque guitar. Jean-Philippe Rameau (25 September, 1683, Dijon – 12 September 1764) is a colossal figure in the development of music. [i] In 1722, he published a Treatise on Harmony (Traité de l’harmonie réduite à ses principes naturels) (Wikipedia). Well, 290 years later, textbooks on harmony teach harmony as described by Jean-Philippe Rameau. Once music students have passed their course(s) on harmony, they may stray from Rameau’s treatise, but even then, Rameau’s treatise remains the standard reference. Until Rameau, Italian composers entertained the French. Italian-born Lully (Giovanni Battista Lulli; 28 November 1632 – 22 March 1687) had been a favorite of Louis XIV. He and Molière (1622-1673), born Jean-Baptiste Poquelin, had collaborated in creating “divertissements” (entertainment) for the king who was immensely fond of ballet. Allow me to quote the Wikipedia entry on Molière. Yet, although Lully collaborated with Molière on comedies, he went on to create French lyric tragedy which Rameau and his contemporaries inherited. However, there was dissatisfaction with respect to the French lyric tragedy, works in the “grand manner,” such as Les Indes galantes or gallantes. Galant is our keyword. Bach’s sons, Wilhelm Friedemann, Carl Philipp Emanuel and Johann Christian, wrote musique galante and were more successful than their father. In fact, Johann Sebastian was forgotten. The matter culminated in the Querelle des Bouffons (“Quarrel of the Comic Actors”) which took place in Paris, France between 1752 and 1754. The Querelle des Bouffons is usually considered as a paper war weighing the relative merits of French and Italian opera. Wikipedia defines the Querelle des Bouffons as “a war of words between the defenders of the French operatic tradition and the champions of Italian music.” But it may be more accurate to say that the French longed for music that brought tears to their eyes. The reign of reason, dating back to Descartes’s Discourse on Method (1637), was being replaced by the reign of sentiment. Despite its reference to buffoons, the Quarrel opposed the loftiest minds of the French enlightenment, including the Encyclopédistes: Denis Diderot (5 October 1713 – July 31, 1784), co-editor of the Encyclopédie, Jean le Rond d’Alembert, co-editor, with Diderot, of the Encyclopédie and a music theorist, (16 November 1717 – 29 October 1783), the Baron Friedrich Melchior von Grimm, a music critic and journalist, French-German Paul-Henri Thiry, Baron d’Holbach (8 December 1723 – 21 January 1789, Geneva-born composer, essayist, author Jean-Jacques Rousseau (28 June 1712 – 2 July 1778). Yet, despite the criticism levelled at him, Rameau was an excellent composer and one who an opera-ballet featuring “Sauvages,” or Amerindians, Les Indes galantes. In the eighteenth century, le Sauvage was a bon Sauvage. This is how he is depicted by travellers to North America and, in particular, by a French military officer who served in New France from 1683 to 1693, the Baron de Lahontan (9 June 1666 – prior to 1716). As described by Lahontan, in three works published at The Hague, in 1703, the Sauvage is morally superior to Europeans in general and the French in particular. The age of the “Noble Savage” is the age of Jean-Jacques Rousseau who led the Querelle des Bouffons (1752 and 1754). The history of Les Indes galantes is particularly interesting in that Rameau drew his inspiration from three kinds of dances performed by Amerindians in the Théâtre Italien. According to Wikipedia, “[o]n 25 November 1725, after French settlers of Illinois sent Chief Agapit Chicagou of the Metchigamea and five other chiefs to Paris, they met with Louis XV, and Chicagou had a letter read pledging allegiance to the crown; they later danced three kinds of dances in the Théâtre Italien, inspiring Rameau to compose his rondeau Les Sauvages.” Changes have been made to Britannica, but the author of its former entry on Les Indes galantes stated that the Amerindians who travelled to France had motivated Rameau to compose his rondeau were from Louisiana, which makes sense. Somewhat mysterious, however, is whether or not this rondeau, entitled Les Sauvages, is a separate piece of music or part of Les Indes galantes. Well, having searched for a solo rondeau entitled Les Sauvages, the piece I discovered was part of the larger Opéra-Ballet. If I have erred, kindly correct me. Les Indes galantes is an opéra-ballet set to a libretto by Louis Fuzelier. It is composed of a Prologue and four acts (entrées) and, as mentioned above, features Sauvages. I inserted an excerpt of Les Indes galantes opéra-ballet in Comments on the Quebec General Election & the News is an excerpt from Les Indes galantes. So my next post features William Christie‘s[iii] “fanciful reading” of Les Indes galantes. I do not have the score of the opéra-ballet, William Christie’s interpretation is not, in my opinion, detrimental to Rameau’s opéra-ballet, as Rameau himself may have envisioned his work. I must close here, but if you wish to take a peak at Les Indes galantes, my next blog constitutes a short and, in my opinion, delightfully-silly performance Les Indes galantes. In 1732, Pergolesi was appointed mastro de cappella to the prince of Stigliano, and, in 1734, he became deputy maestro de cappella, in Naples. There had long been tension between Italian music and French music, then dominated by Jean-Philippe Rameau, the author of a Treatise on Harmony, published in 1722. As you know from an earlier blog, this treatise remains authorative. But although the “querelle ” could be considered as yet another battle in the war between French “ramistes,” the name given supporters of Rameau, on the one hand, and lovers of Italian opera and commedia dell’arte, on the other hand, it may be best to suggest that it opposed reason and sentiment, or sense and sensibility. YouTube allows one to listen to and to view the Serva padrona in its entirety, but Pergolesi’s Stabat Mater remains the centrepiece. I hope you enjoy listening to some music composed by a forever young Pergolesi who died in poverty in a Franciscan monastery, at Pozzuoli, near Naples. [i] “Giovanni Battista Pergolesi.” Encyclopædia Britannica. Encyclopædia BritannicaOnline. Encyclopædia Britannica Inc., 2011. Web. 20 Dec. 2011. http://www.britannica.com/EBchecked/topic/451597/Giovanni-Battista-Pergolesi>.